In geography, a horizontal angle is the measure of an angle between two lines originating from the same point. In topographical applications, a horizontal angle is often calculated between two lines of sight. For example, if a person is standing atop a hill and looks out at two separate landmarks, the horizontal angle would be the angle between his line of sight to object A and his line of sight to object B. When dealing with multiple horizontal angles, it may be helpful to take the mean or average of those by calculating the mean horizontal angle. Measure the relevant horizontal angles. Typically, horizontal angles are measured in degrees, from 0 to 360. An angle of 90 degrees would be a right angle, which is formed by two perpendicular lines. If an individual took the horizontal angle of his line of sight when looking straight north and straight east, this would measure 90 degrees. A horizontal angle can be measured using a magnetic compass with an outer graduation ring which measures degrees from 0 to 360 in a circle. Because the needle of a magnetic compass always points directly north, you can use it as a baseline for your measurements. Orient your outer graduation ring so 0 degrees aligns with north, as determined by the magnetic needle. Select a landmark and form a line of sight with this landmark. Record the angle of the line of sight relative to north. This angle is known as the azimuth. For example, if you were looking at an object directly to the south, the azimuth would be 180 degrees. Repeat this process for the second object you are making a line of sight with. The difference between their azimuths is the horizontal angle. Repeat this step for each horizontal angle you wish to measure. Add up the relevant horizontal angles. 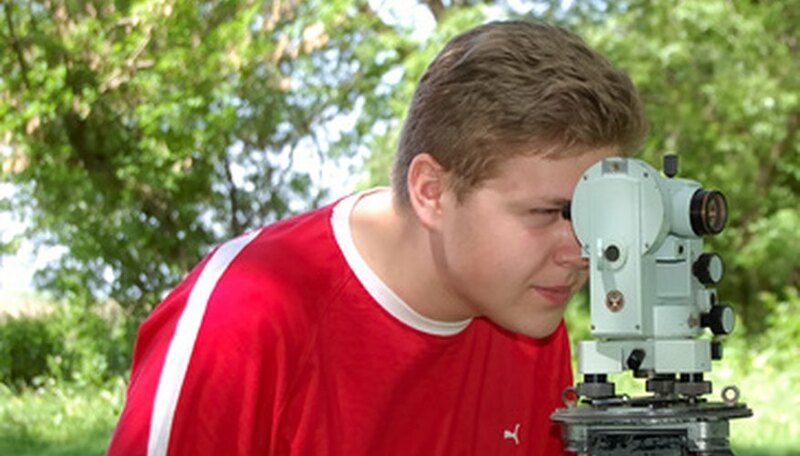 If you are attempting to record the average horizontal angle between your line of sight with two particular objects, for example, you may wish to measure this angle daily and add up these observations. Divide the sum of your observations by the total number of observations made. For example, if you measured the horizontal angle between two objects daily for 30 days, divide the sum of those 30 observations by 30. Your answer will be the mean horizontal angle. Richards, Bryan. "How to Calculate Mean Horizontal Angles." Sciencing, https://sciencing.com/calculate-mean-horizontal-angles-7618561.html. 24 April 2017.